Raffle Ticket for $100 market bag giveaway. This Sunday is your last chance to enter the drawing for the $100+ 4MRMarket bag giveaway! We've seen people with their raffle tickets out getting each vendor checked off, but we still don't have many turned in. That means you have a great chance to win the give-away if you come by and shop tomorrow! Bring your raffle ticket if you already have one, print one, or pick one up at 4MRMarket. To enter to win, buy something from each of the 6 vendors listed on the raffle ticket and get them to mark your raffle card. Fill in your information so we can contact the winners, and drop it with the market managers. You'll have to have made a purchase at each of the 6 vendors on the raffle ticket this Sunday or in the last 2 weeks. Remember, you can also get 10% off your purchase at some of the vendors, where indicated! Make sure to come early this week as it's supposed to be hot and humid as the day goes on. We're open at 8, so you can beat the heat and still get great fresh produce, cheese, meats, baked goods, drinks, and many handmade items from our artisans. 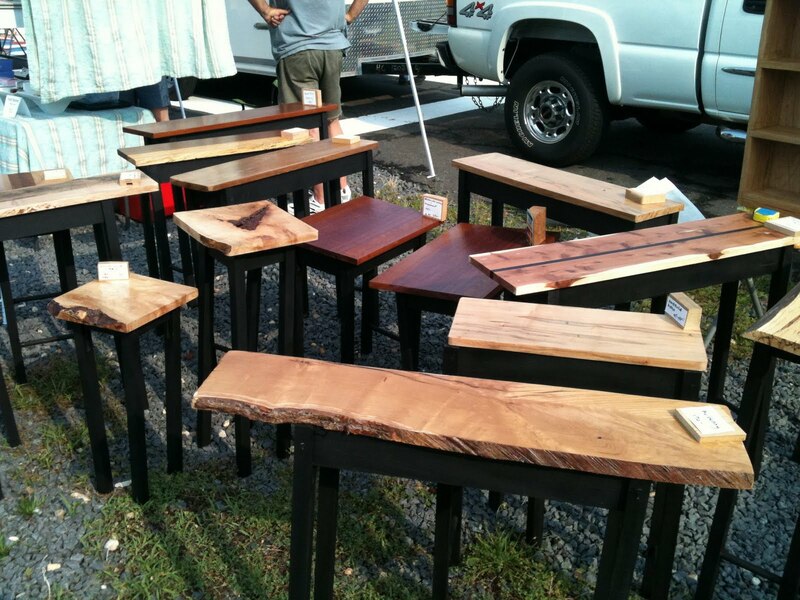 New this week is handmade furniture craftsman Chris Waters/Waters Woods. 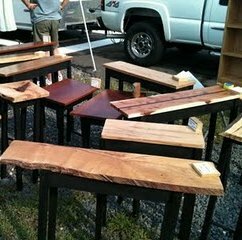 Hand crafted tables by Waters Woods. Pleitez Produce (Northern Neck) - A full range of locally grown produce, herbs, and more. Bread and Chocolate (Arlandria) - A range of baked goods. Herban Avenues at AHHA Ranch (Lovettsville, VA) - Herbal remedies, amazing soaps, heritage breed chicken eggs, and a variety of herbs. C&T Produce (White Oak, VA) - A huge selection of locally grown produce. St. Elmo's Coffee Pub (Del Ray) - Brewed coffee, tea, and a few extra goodies. Tom's Amish Cheese Store (Lancaster, PA) - Artisan Cheese, yogurt and Pennsylvania honey. Chris Waters Furniture - Beautiful, rustic tables, bookshelves, and other furniture items, all handmade. Uncommon Knits (WV) - Handwoven linens made with 100% cotton and hand-stitched hems for your kitchen, dining room and bath. Yoli B. (Hanover, MD) - Hand-stitched kids clothing. Sweet Hearts Patisserie (Fairfax, VA) - a Northern Virginia based patisserie specializing in gourmet victorian petit fours and other miniature sized pastries. Sweet Hearts petit fours are made in a variety of delectable flavors and designs, and make the perfect gift or tea time treat. VeloCity bike co-op will be on-site doing teaching bike maintenance and repair. In our 4MRMarket Tent come meet folks from the Dominion Green Power Program. If you're a SNAP/EBT participant, remember to come out and take advantage of the Inova-sponsored "Double Dollar" program that doubles the first $10 SNAP participants spend at the market. 4MRMarket is the first farmers’ market in Northern Virginia (and still the only) to accept SNAP. If you'd like to volunteer with the 4MRMarket, we have set up a new on-line way to sign-up. Go to: volunteer.4MRMarket.org to sign up or look for the volunteer tab on our website. You'll be able to volunteer to help process SNAP/EBT sales, help us keep our books, help set up or tear down for the market, or help us find musicians to play the market. You can also find a Market Manager to ask to help, or email us at 4mrm@arlandria.org for more info. Do you like to bike to 4MRMarket? If so, please fill out this survey from the League of American Bicyclists to help get 4MRMarket certified as an official Bike Friendly Business. 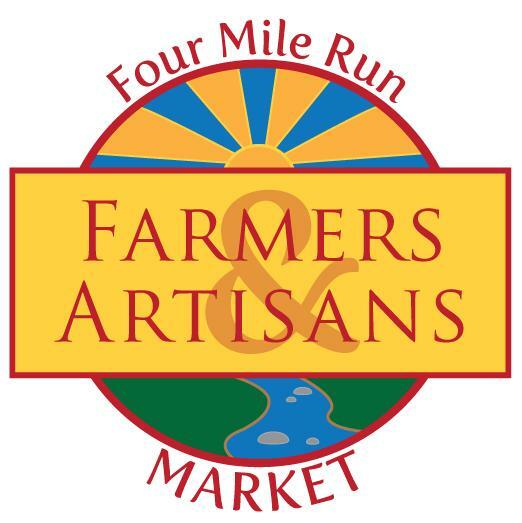 The Four Mile Run Farmers and Artisans Market (Alexandria, Virginia 22305) brings fresh, nutritious food to people of all income levels, provide an opportunity for local artisans and producers of goods to bring their wares to market, strive to reflect the diversity of the community, and improve the quality of life for Arlandria residents and visitors. It is part of an overall vision to expand and improve Four Mile Run park and the surrounding neighborhood. 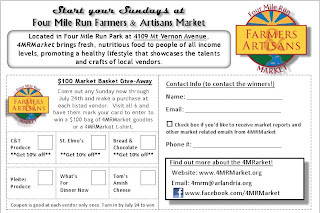 4MRMarket is open every Sunday from 8am until 1pm from May through October in Four Mile Run Park at 4109 Mt Vernon Avenue, Alexandria.